Olivia Danielli, the wife of former Scottish rugby international Simon Danielli, leaves Newtownards court after being found guilty of causing criminal damage to his Jaguar car. The estranged wife of Scotland's former rugby World Cup ace Simon Danielli has been fined £500 for damaging his car in a fit of rage. Olivia Danielli, 29, smashed the wing mirror of her ex-partner's luxury Jaguar using an umbrella handle and threw it at the bonnet after a row at his home about the babysitting of their children in August 2015. A non-molestation order had been in place between the warring pair for six months before Mrs Danielli erupted over their three young children allegedly being minded by women she did not know. She took her frustration out on a car, which she gave her husband £34,000 to buy before their split. She said: "I was just really upset and annoyed at Simon. The thought that he had my car in his drive and he was using that to drive around other girls with my kids. "I was just really hurt and upset by the situation." Former Scottish rugby international Simon Danielli leaves Newtownards court after his wife Olivia Danielli was found guilty of causing criminal damage to his Jaguar car. Newtownards Magistrates' Court in Northern Ireland was played a video Mr Danielle recorded on his phone of his wife damaging the gleaming motor. District judge Mark Hamill dubbed the case "nonsense on stilts" and threatened the couple with stiffer penalties should their matters come before the courts again. He ordered the former model to pay the £1,800 cost of repairing the damage. The judge said: "She attacked the car to get back at him quite clearly and this, I am afraid, is nonsense on stilts." Danielli, 37, is a former winger for Bath and Scotland and starred in his country's 2011 World Cup bid. He rescued Scotland from an embarrassing defeat against Romania in their first game of the tournament by scoring two tries in the dying moments of the match. Danielli and his wife were married in 2009 and separated in September 2014. 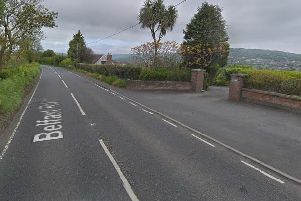 They have three children aged five, four and two and live a short distance away from each other in Holywood in Co Down. Mrs Danielli, from Marino Station Road in Holywood, was charged with criminal damage and fought the case in court because she believed it was her car, her lawyer said. The Jaguar XF had been bought after she borrowed the money but was insured in her former partner's name for several months. She had never driven it. The defendant gave her version of events. She said: "I was angry with him so I thought I would take it out on my car." Tensions between the couple boiled over after her children told her their father went out at night and they were left with "random" babysitters and neighbours and people she did not know. She added: "That causes concern for me. "I want people I know looking after my young kids. "He told me it was none of my effing business who he leaves the kids with. "I told him I was really unhappy, I told him I did not think it was right to be going out all night." During their conversation someone rang her phone. Mrs Danielli recalled her husband saying: "There's Michael ringing you." She claimed he ended up pushing her out of the door. "He slammed the door on my arm and badly bruised my arm, I was crying and upset by what had happened." Danielli told police he heard his separated partner pull up outside in her Porsche Cayenne and bang his front door. He said: "She said she wanted the baby sitters' names and I could not see the children again until she did. "She forced her way into my home, asked for the babysitters' names and said she would not be leaving until then." He said she sat in the car for two or three minutes before emerging clutching the umbrella. In the video Danielli took, the accused could be seen repeatedly striking the wing mirror, then picking part of it up from the ground and throwing it at the bonnet of the car. Danielli made 41 appearances for Bath between 2001 and 2004 before playing in Scotland and Northern Ireland. He retired from rugby in 2012 because of a back injury.